• Get the Scoop on Your Ancestors with Newspapers — Yearning to “read all about it?” Newspapers are a fantastic source of research leads, information and historical context for your family history. Learn Lisa’s approach to achieve success in locating news about your ancestors. • Genealogy Podcasts 101 — Learn everything you need to know about how to find and listen to genealogy and history podcasts. • Time Travel with Google Earth — Experience historic maps, images and videos coming together to create stunning time travel experiences in the free Google Earth program. • Inspiring Ways to Capture the Interest of the Non-Genealogists in Your Family — Learn how to capture the imagination of your non-historian friends and relatives. Lisa’s projects are guaranteed to inspire your family to ask you to tell them more about the family tree! 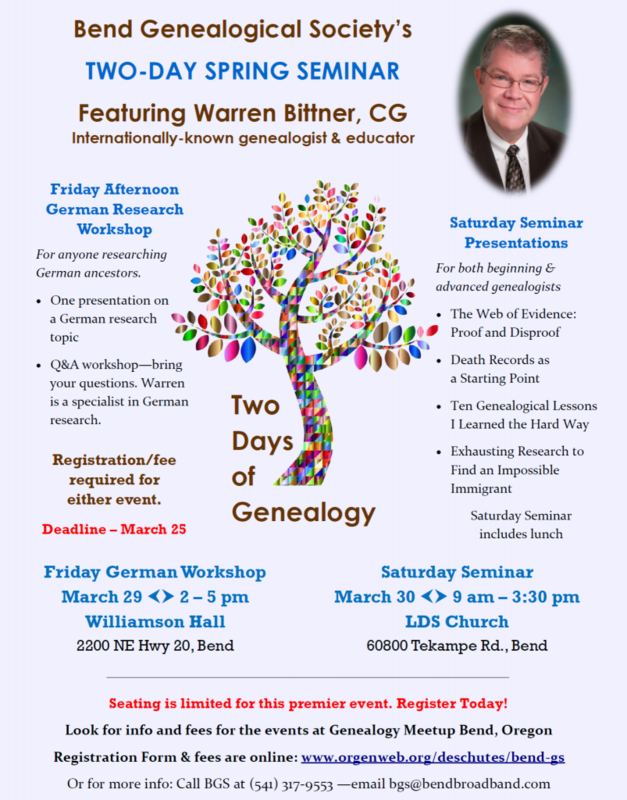 Lisa’s presentations are de-signed for both beginning & advanced genealogists. • Check in and enjoy a cup of coffee or tea. Breakfast not provided. • Saturday Seminar, April 23, 9:00 a.m. to 4:00 p.m. at the Bend Golf & Country Club. • Choice of Luncheon Salad and Coffee/Tea service all day. We will confirm registrations via phone or email. NOTE: A traffic circle is under construction at the intersection of Murphy & Parrell. You will need to use a detour this year to reach the Country Club. Coming from the south, exit Hwy 97 at Knott Road. Coming from the north on the parkway, there are various routes you can choose to reach the site. 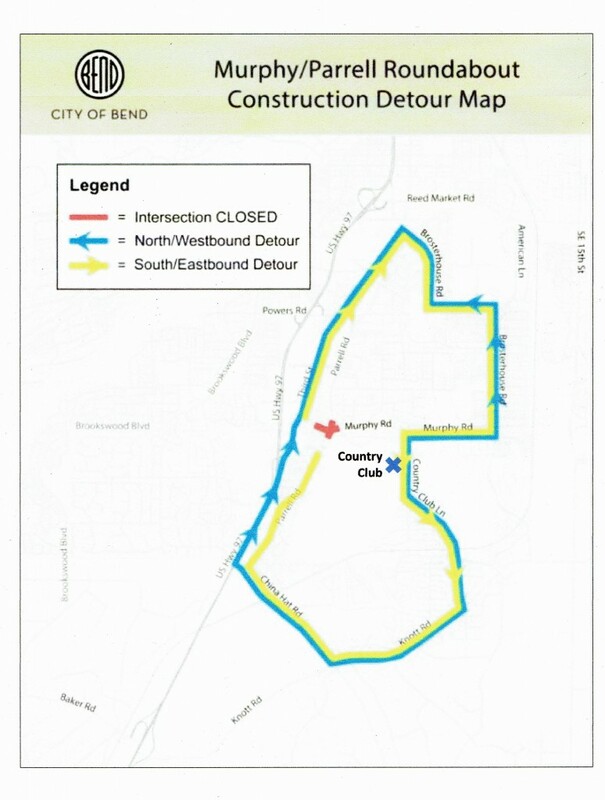 View detour map at: http://www.bend.or.us/index.aspx?page=1253Or call BGS for directions, if needed. We can email you the construction detour map. 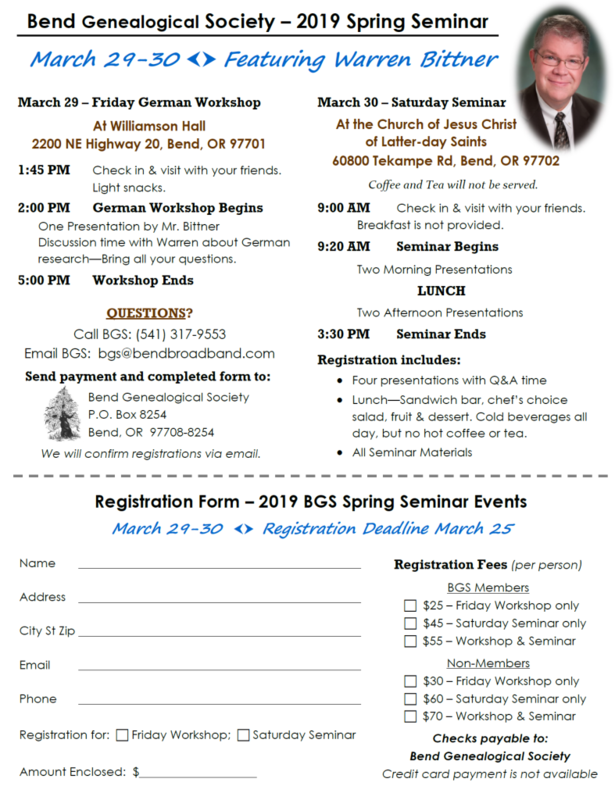 Just wanted to let you know that registration for the Spring Seminar will be closed April 21st.